Terrorists have reportedly set dozens of fires across Israel in their latest attempt to kill Jews and destroy the country. Firefighters from several nations have flown to Israel to help fight the arson attacks. Firefighting aircraft from Greece, Cyprus, Italy, Russia, Croatia are helping fight the fires across Israel; more expected from Turkey, UK. The Haifa fire was started in five different locations. Political leaders blamed Muslim terrorists for the fires. 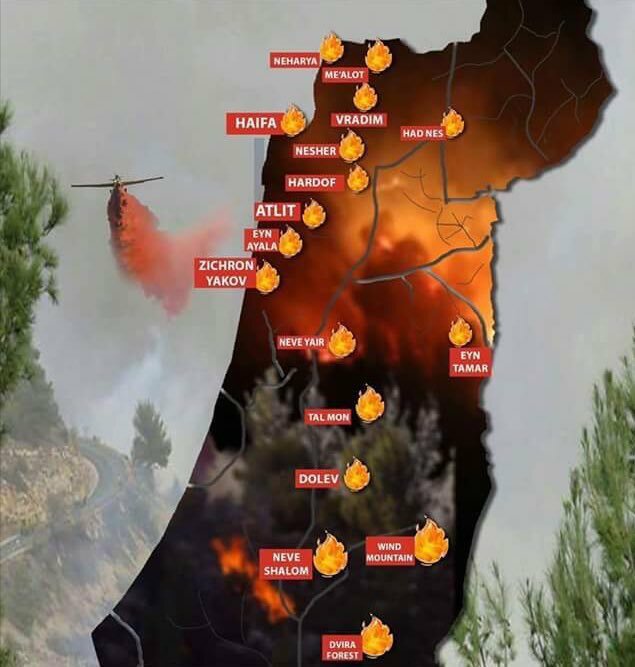 Likud and Bayit Yehudi MKs warned that the fires raging across Israel are terrorism on Thursday. Culture and Sport Minister Miri Regev said “anyone who has eyes and a brain can see that the fires in many places in Israel are not natural. “We must find the terrorists who are burning our forests and endangering human lives,” Regev said, thanking firefighters for working to put out the blazes. Transportation and Intelligence Minister Yisrael Katz said he plans to propose legislation that would allow the government to foreclose on the home and possessions of anyone who is convicted of arson, so that the victims can be repaid and so people are deterred from setting fires. Some Palestinians don’t agree with the terrorism… but only because they claim Israel is their land. Some are celebrating the fires.